Like most actors, you probably have an idea of the kind of career you want to have. Perhaps you want to be on the silver screen, or in people's homes on television, or on Broadway. Regardless, you want to be living out your passion but you don't know how to do it and furthermore how to do it effectively. You want to WORK. We’re not offering a magic solution. What we do offer is a chance to learn the proven strategies that will help you become part of the 2% who get called in and book by becoming the most authentic version of yourself while investing in yourself and your business. With AGR by your side, as long as you play full out, your journey will be highly rewarding. So what makes us different than the other companies? Well, for one, we provide free purified water at our classes and intensives. :) That and we are nothing like the others. We nurture our students both personally and professionally (with business/casting director workshops/etc AND we offer holistic classes that focus on the inner work) thus providing an optimal full spectrum experience known as #theagrexperience. We believe that there is enough room for everyone and in the power of community. We believe in the yin/yang of things - that one cannot play an instrument optimally if there is dust inside of it. We focus on training AND making sure one's instrument is free and clear of anything that could block its success. We welcome both newbies and seasoned actors. Whether you are just getting into the business and want to learn all there is to know or have a heavy resume and are looking to get to that next level, our classes & events offer opportunities for both. We don't believe in fees. We just believe in YOU. With day and night intensives topping out at 16 students per class, we create a supportive, laidback, professional atmosphere where our students and guests thrive. Unlike at any other place, we set our classes and intensives up to simulate the audition process. One student at a time goes into our studio to work on camera with the guest CD and our reader while the rest of the class watches the process on a monitor from the main room. At every class and/or event, we provide current film & television scenes along with an outstanding working actor to support you in your process. Scenes really allow actors to connect and show their stuff whereas monologues do not. Sometimes our guest teachers like to assign their own sides but sometimes...you get to come to the table with your own! We provide current film & television scenes (often times along with character breakdowns) for you to choose from. Know thyself as an actor and choose material that suits you and allows you to shine in your most organic light. If you have had a Career Consultation, you will be able to use those sides as well. Want to meet the casting directors of top episodics or for major feature films? No problem. We got 'em on our roster. Want to meet the best agents and managers from all over the industry? You shall. Our guests flock to us as they love our vibe, our formats, and the talent that we bring to them. We email every class student their on-camera work (often times before each class is even over) in the form of a High Definition QuickTime movie. Watch it, save it and review it later...our class benefits are timeless. Here at The Actor's Green Room, we want to know you. We want to talk to you and make you feel at home. We develop relationships with all of our actors and make everyone feel comfortable and at ease. Why? Because we care. We are not a machine. We are human beings who take pride in what we do and in you. 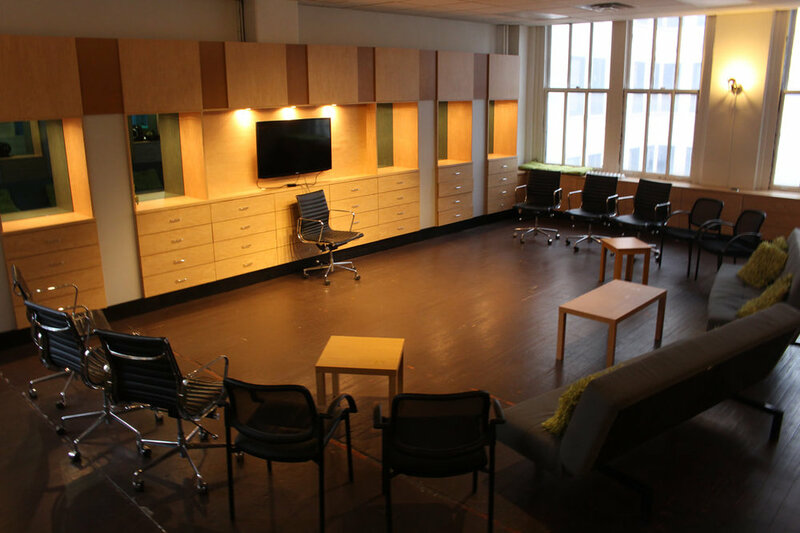 INTERESTED IN BECOMING A PART OF THE ACTOR'S GREEN ROOM? Check out our Work/Study Program! *Please do not submit if you are not a regular attendee at The Actor's Green Room. 15 West 28th Street (between 5th Avenue and Broadway), on the 9th Floor. When designing our New York space, we kept the ideas of Zen and relaxation in the forefront of our mind. Using our color scheme, we wanted to create an oasis where actors could feel comfortable and at peace in order to do their best work. Casting directors will either assign specific sides or we will provide a link to our general database. A link to sides for classes/events/intensives will be included in your booking confirmation email. Sides must be from Film or Television and cannot be a monologue. Sides may not exceed two minutes in length. In order to guarantee a spot in a desired class, intensive or event, payments must be processed through either our online booking system or over the phone. Credits are issued during business hours only. If you are enrolled in a multi-week class, partial credit cannot be issued for a missed class. For credit, the entire class must be cancelled within 7 or more days in advance, or with the proper documentation up to 24 hours before the class. Please do not post about cancellations in the Green Lounge Facebook group. If you booked one of the eligible events or intensives up to 3 days prior to the sale/discount announcement, please email us immediately. We will issue your AGR account a credit in the amount that you would have saved with the discount. Bookings made more than 3 days before a sale/discount was announced do NOT qualify for a credit. Retroactive discount credits will NOT be offered for SOLD OUT classes/intensives/events. Discount codes and promos are only valid before they expire. If you book a class with a discount code, have to cancel it, or it is cancelled, you will be credited equal to the amount you paid. If the class is rescheduled, or you make a different purchase after the discount code expires, you will have to pay the difference. Sales and other discounts cannot be combined. If there is a holiday sale and you have purchased the 6 for 5 package deal, you will not be able to combine both. All of the Industry that we invite to our classes and events are very busy professionals as well as human beings with life circumstances that may arise. In the event that an industry guest is unable to attend an event, another guest from the same office or a comparable industry member will attend in his/her place. On occasion, our classes may need to begin a little later or earlier than anticipated due to a casting director's life/professional circumstances. You will be notified of this via email. If an Industry Guest has to cancel or reschedule their event entirely, you will be notified via email and your account will be issued a credit that you can use towards another class/event. Our classes, events and intensives (unless otherwise noted) are for ages 13 and up. If you are accompanying your teenager to an event at either AGR NY or LA, you are welcome to wait in the holding room with your teenager, but cannot go into the audition room. Under no circumstances will a parent be allowed in the audition room with their child. We do our very best to ensure that our video recording system runs smoothly and that your on-camera work is recorded without any issues. It works 99% of the time. In the 1% chance that there is a technical glitch and we are somehow not able to email you your on-camera work, we cannot be held responsible or liable. At AGR, we record your on-camera work with the designated casting director and email it to you. These videos are for education purposes only and are NOT to be posted on YouTube, Facebook, or any other public viewing site. Any actor who violates this policy will be banned from attending future classes, events or intensives.